A reduction of carbon emissions from Chinese power plants would do far more to help reverse climate change than — dare I say it? — blocking the Keystone XL oil pipeline. The fact is that, as RealClimate has explained, we would need “an immediate cut of around 60 to 70% globally and continued further cuts over time” merely to stabilize atmospheric concentrations of CO2 – and that would still leave us with a radiative imbalance that would lead to “an additional 0.3 to 0.8ºC warming over the 21st Century.” And that assumes no major carbon cycle feedbacks kick in, which seems highly unlikely. We’d have to drop total global emissions to zero now and for the rest of the century just to lower concentrations enough to stop temperatures from rising. Again, even in this implausible scenario, we still aren’t talking about reversing climate change, just stopping it — or, more technically, stopping the temperature rise. The great ice sheets might well continue to disintegrate, albeit slowly. This doesn’t mean climate change is unstoppable — only that we are stuck with whatever climate change we cause before we get desperate and go all WWII on emissions. That’s why delay is so dangerous and immoral. For instance, if we don’t act quickly, we are likely to be stuck with permanent Dust Bowls in the Southwest and around the globe. I’ll discuss the irreversibility myth further below the jump. First, though, Nocera’s piece has many other pieces of misinformation. He leaves people with the impression that coal with carbon capture and storage (CCS) is a practical, affordable means of reducing emissions from existing power plants that will be available soon. In fact, most demonstration projects around the world have been shut down, the technology Nocera focuses on would not work on the vast majority of existing coal plants, and CCS is going to be incredibly expensive compared to other low-carbon technologies — see Harvard stunner: “Realistic” first-generation CCS costs a whopping $150 per ton of CO2 (20 cents per kWh)! And that’s in the unlikely event it proves to be practical, permanent, and verifiable (see “Feasibility, Permanence and Safety Issues Remain Unresolved”). Heck, the guy who debated me on The Economist‘s website conceded things are going so slowly, writing “The idea is that CCS then becomes a commercial reality and begins to make deep cuts in emissions during the 2030s.” And he’s a CCS advocate!! 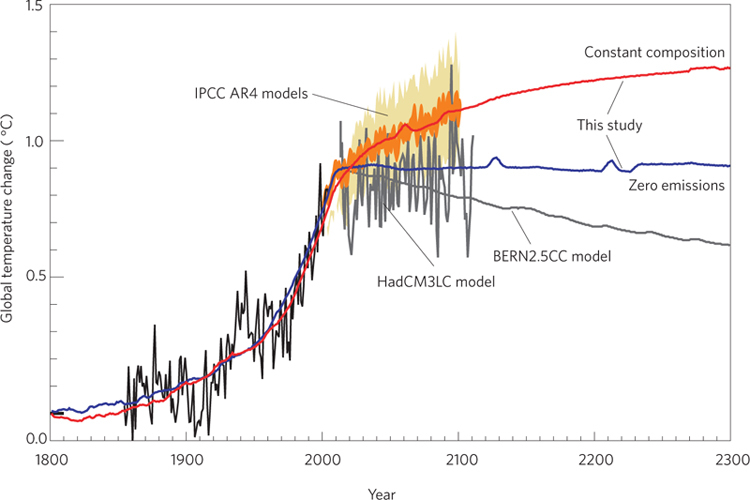 Of course, we simply don’t have until the 2030s to wait for deep cuts in emissions. No wonder people who misunderstand the irreversible nature of climate change, like Nocera, tend to be far more complacent about emissions reductions than those who understand climate science. Using carbon emissions to recover previously ungettable oil has the potential to unlock vast untapped American reserves. Last year, ExxonMobil reportedthat enhanced oil recovery would allow it to extend the life of a single oil field in West Texas by 20 years. D’oh! What precisely would be the point of “sequestering” all that CO2 to extract previously “ungettable oil” whose emissions, when burned, would just about equal the CO2 that you supposedly sequestered? Remember, we have to get total global emissions of CO2 to near zero just to stop temperatures from continuing their inexorable march toward humanity’s self-destruction. And yes, this ain’t easy. But it is impossible if we don’t start slashing emissions soon and stop opening up vast new sources of carbon. Public attitudes about climate change reveal a contradiction. Surveys show most Americans believe climate change poses serious risks but also that reductions in greenhouse gas (GHG) emissions sufficient to stabilize atmospheric GHG concentrations or net radiative forcing can be deferred until there is greater evidence that climate change is harmful. US policymakers likewise argue it is prudent to wait and see whether climate change will cause substantial economic harm before undertaking policies to reduce emissions. Such wait-and-see policies erroneously presume climate change can be reversed quickly should harm become evident, underestimating substantial delays in the climate’s response to anthropogenic forcing. We report experiments with highly educated adults–graduate students at MIT–showing widespread misunderstanding of the fundamental stock and flow relationships, including mass balance principles, that lead to long response delays. GHG emissions are now about twice the rate of GHG removal from the atmosphere. GHG concentrations will therefore continue to rise even if emissions fall, stabilizing only when emissions equal removal. In contrast, results show most subjects believe atmospheric GHG concentrations can be stabilized while emissions into the atmosphere continuously exceed the removal of GHGs from it. These beliefs-analogous to arguing a bathtub filled faster than it drains will never overflow-support wait-and-see policies but violate conservation of matter. Low public support for mitigation policies may be based more on misconceptions of climate dynamics than high discount rates or uncertainty about the risks of harmful climate change. Again, zero emissions merely stops climate change, and obviously, thanks to fossil-fuel funded Tea Party politicians along with the deniers and the ignorati, we won’t be going to zero anytime soon. But you have to remember that the climate changes so far, both observed and committed to, are minor compared with the business-as-usual forecast for the end of the century. It’s further emissions we need to worry about. Climate change is like a ratchet, which we wind up by releasing CO2. Once we turn the crank, there’s no easy turning back to the natural climate. But we can still decide to stop turning the crank, and the sooner the better. Indeed, we are only committed to about 2°C total warming so far, which is a probably manageable — and even more probably, if we did keep CO2 concentrations from peaking below 450 ppm, the small amount of CO2 we are likely to be able to remove from the atmosphere this century could well take us below the danger zone. But if we don’t reverse emissions trends soon, we will at least double and probably triple that temperature rise, most likely negating any practical strategy to undo the impacts for hundreds of years. Joe Romm is a Fellow at American Progress and is the editor of Climate Progress.